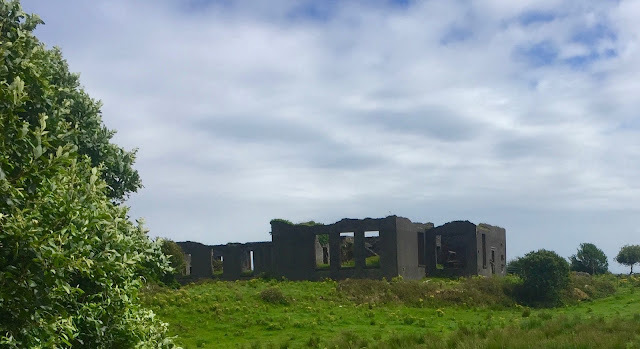 Roofless stone cottages are common in Kerry, but from the highway between Castle Cove and Caherdaniel, you can see what looks like the ruins of an entire village. One local told me a legend that people who lived there ran away from their homes after being haunted by a neighbor they had cruelly exiled. Now I know the real story, there could be truth to that other one. I've seen plaques and statues of Ireland's female heros now and then, but like everywhere else in the world, public monuments to real women are rare in Ireland. Her grave is just on the other side of the plaque, under that tall celtic cross in the churchyard. Gobnait Ni Bhruadair (sometimes spelled Bhrudair or Brudair) renamed herself in the middle of her long life. According to online dictionaries her new surname name could refer to "dreams" or indicate "an impudent person." Her first name was in honor of St. Gobnait, the healing Abbess of Ballyvourney with whom I have had many, many, encounters this summer. When she was born, her parents named her Albinia Lucy Brodrick. Her father was the 8th Viscount Midleton and both parents were well-connected English aristocracy. The Midleton estates were in the rich farmland of East Cork. Albinia first visited Ireland with her father in his annual visits. He nearly was blind, and she assisted him in his public and private business. Later she worked as an assistant to her uncle, and then her brother, until she was in her early 40s. She never married, and around 1903 become estranged from her family for reasons that are not publically known. But that year she moved to Dublin and studied midwifery, qualifying in 1905. She joined Gaelic League and studied Irish language. Beyond her work as a nurse, she advocated for professional training for nurses. In 1907 she was Chief Steward of the International Congress of Nurses. She was known as a feminist who spoke frankly about birth control, venereal disease, and women’s suffrage. Her ambition, idealism, and forward-thinking views did not engender official support for her next project. 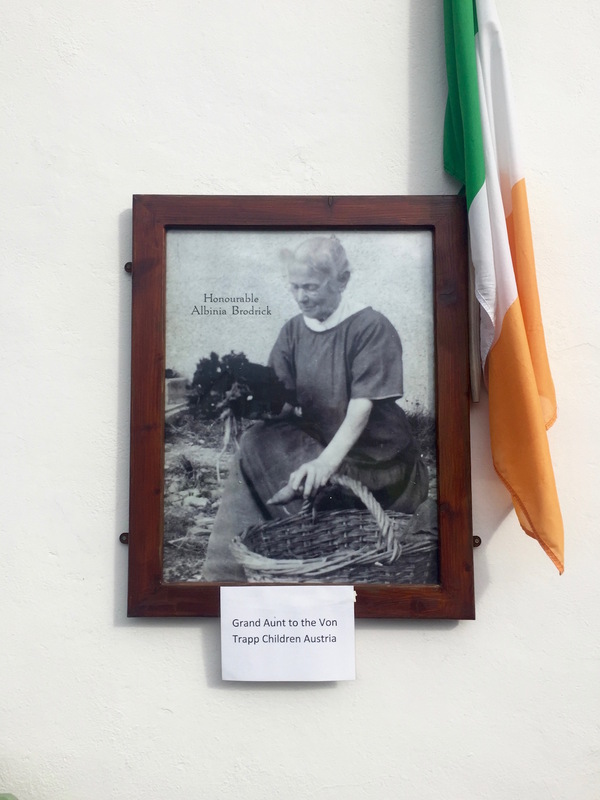 She moved to a poor and remote area of Co. Kerry, and changed her name to Gobnait Ni Bruadair. 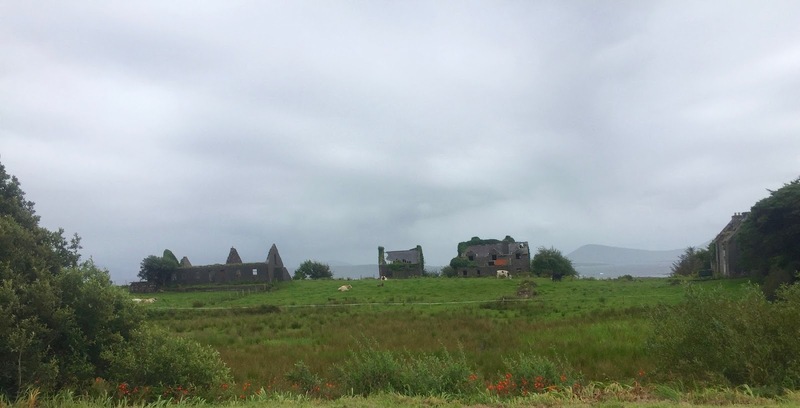 She purchased 13 acres west of Sneem, and named it Ballincoona (Baile an Chúnaimh or "Home of Help"). She built a hospital where it was needed most, an area where to this day has no hospital. She is recorded as saying “I am doing penance for my grandfather. He was a tyrant in the days of the famine." The hospital. 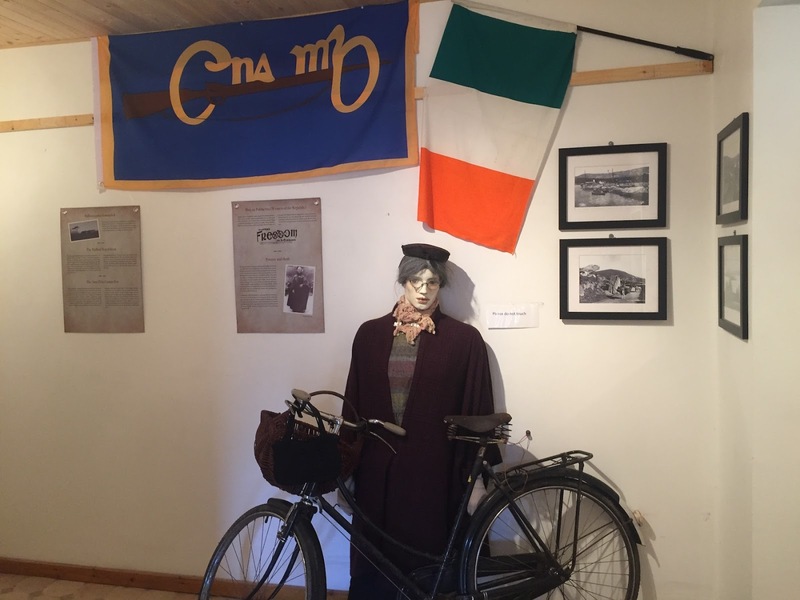 Photograph from the exhibit about Gobnait Ni Bhuadair at the Geopark Centre, Sneem. 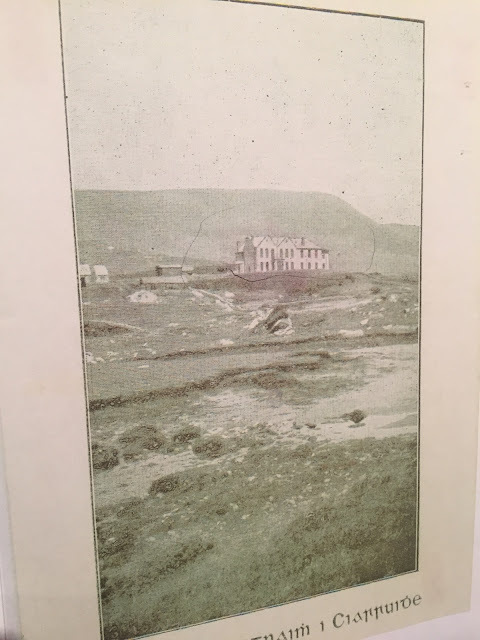 By 1912 she had spent her inheritance on construction and improving the land and had no money left to actually run it. As Ireland was still part of Great Britain in WWI, she offered the hospital to the British military, but they refused, saying it was too remote. I've been told the Co-op was the building on the right. On the same land she founded the Kilcrohane Cooperative society, based on the program of her friend Horace Plunkett. The cooperative movement was controversial, as co-ops lowered prices for consumers, but competed with producers who wanted to keep prices high. The co-op at Ballincoona lasted until the 1940s, but doesn't seem to have been very successful. During that same World War that might have provided Gobnait's hospital with patients and a government contract, revolutionaries declared an Irish Republic on Easter Sunday, 1916, in an event known as The Rising. 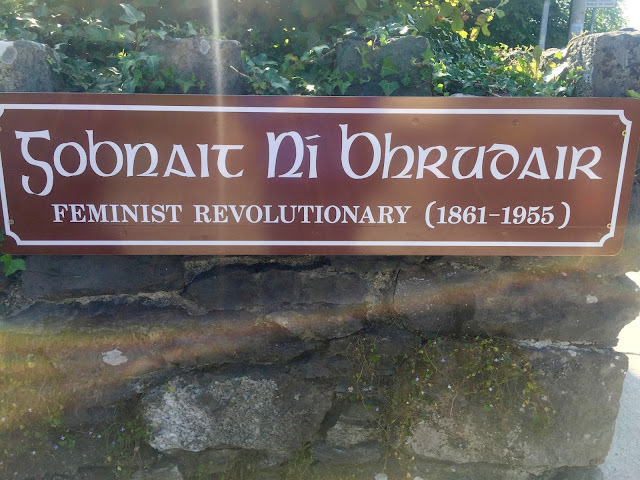 Gobnait supported the Rising, joining the Irish Republican women's organization, Cumann na mBan. After the World War, Ireland fought a War of Independence from 1919 to 1921. That war ended in a treaty which caused an Irish civil war between factions that supported the treaty (Free Staters), and others who did not support its terms, which included a partitioned island. Gobnait supported the anti-treaty side. During the Civil War she was wounded when she ran a checkpoint on her bicycle. She was then arrested and jailed in Dublin, where she went on a hunger strike like other republicans. As she was in her 60s, this threatened her life, and she was released after a few weeks. During the Civil War, she dismantled the roof of her hospital to avoid its use as a garrison by Free State forces. She sent its contents to a hospital in India. The buildings fell into the ruin that we see today. Although she no longer had her own hospital, she was active in reforming others, for example, the Killarney Mental Hospital, where she pioneered new policies such as not calling it a "lunatic asylum" and training nurses in the needs of the mentally ill.
She was active in building her new country, and maintained her political views. 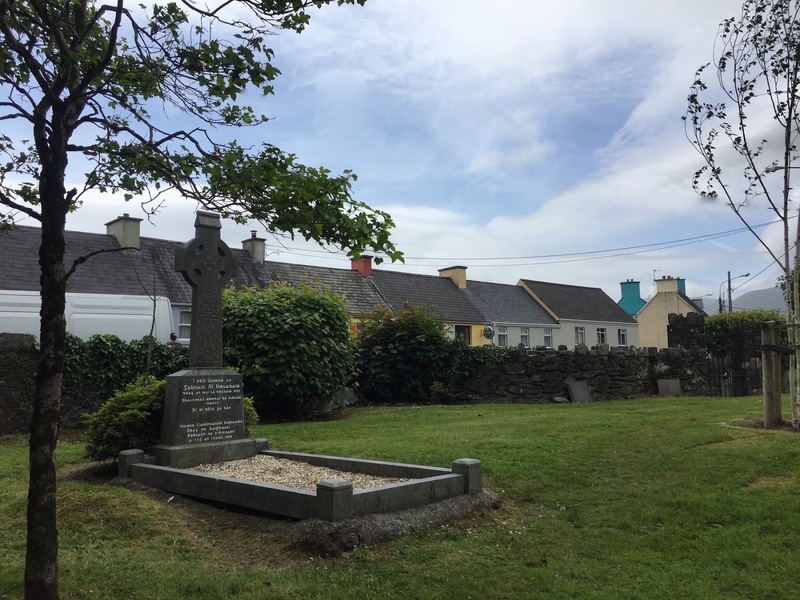 She was elected to the Kerry County Council before the War of Independence had even ended, but resigned near the end of the Civil War over the execution of republican prisoners, who she believed should have been considered prisoners of war. She maintained membership in the Cumann na mBan but resigned in 1933 along with many other original members because of its refocus on social issues rather than the “national question” of ending the partition of Ireland. She worked as a journalist, and was editor of the Sinn Féin newspaper, Saoirse between 1926 to 1937. She lived near Sneem until she died, in poverty. Locally she was legendary for her thrift, wearing shoes until they fell apart, selling eggs for tea, traveling on her bicycle. She died in 1954 at nearly 94 years of age, leaving her property to republicans "as they were in the years 1919 to 1921.” Her will was eventually ruled invalid, but her intent was as clear and consistent as ever. This photo is posted outside the Gobnait Ni Bhudair exhibit. The sign refers to Gobnait's sister's daughter who married an Austrian, had several children, and died young. The children needed a governess, and a musical was born. I can find no further information about the photograph. Who hasn't wished to give our final estate to those people who hold on to the pure ideals of our earliest conversion? Gobnait reminds me of women I have known, women who changed their name at mid-life to mark their rebirth; women who spent their daddy's money to atone for his abuse; the converted zealots who embarrasses everyone with impractical, unpopular, and culturally insensitive philanthropy. I wonder if I would have drunk tea at her table and dug her potatoes, or was she too impulsive and controlling to be anyone's close friend? Was she a dreamer? or an impudent person? She haunts me. 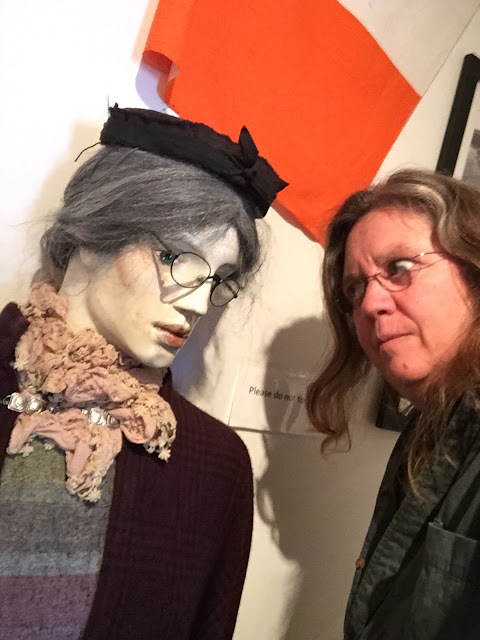 I wish I could have met her, instead of this mannequin at the museum. The factual info in this post is sourced from an exhibition at the Sneem Geopark Centre, created by its administrator, Julie O'Conner. I also used an article by Martin Mansergh published in the Sneem Parish News (not available online). If not from their work, then material was found via various easily searchable online sources.